It was January 1, and I was gung-ho to begin my New Year’s resolution. My plan was to start a rigorous elimination diet in the hope of feeling better. I purchased ingredients to make healthy meals, and I set aside time to cook for the week. I knew it was going to be hard, but I reached a tipping point in my chronic illness and knew I had to try more drastic measures. After a week, I started to regain some energy. I repeated the tasks of grocery shopping and cooking for myself the next week, and I felt encouraged. Then, “life” got in the way of my plans. A couple of my children got sick. A couple others had projects and activities that required my attention. I was needed elsewhere. I ran out of all of those nourishing meals, and I didn’t have much time to cook another batch. I needed grab-and-go options, which really weren’t part of my plan. Frustrated and tired, I lost my motivation. I felt discouraged and lonely. How long did my New Year’s resolution last? About three weeks. Sigh. It was hard to get back on track, because I feared failure again. I started looking forward to Lent, which was my chance to start over. For Lent, I decided to approach my resolution differently. As I reflected on my three weeks in New Year’s resolution mode, I noticed that I was relying solely on myself to succeed, and I wasn’t allowing any room for flexibility, patience, or God’s grace. We are one week into Lent, and perhaps your Lenten resolution feels a lot like my New Year’s one. It’s been only eight days, and already you think you’ve failed Lent. I know I had the temptation to think like a failure on the eve of Ash Wednesday when, after resolving to eliminate grains for Lent, I was faced with the reality of eating oatmeal for dinner. So, yes, not even a day into Lent, and already I had fallen off my Lenten plan! But what I immediately realized was how my response was so vastly different from how I reacted when I took a detour from my New Year’s resolution. 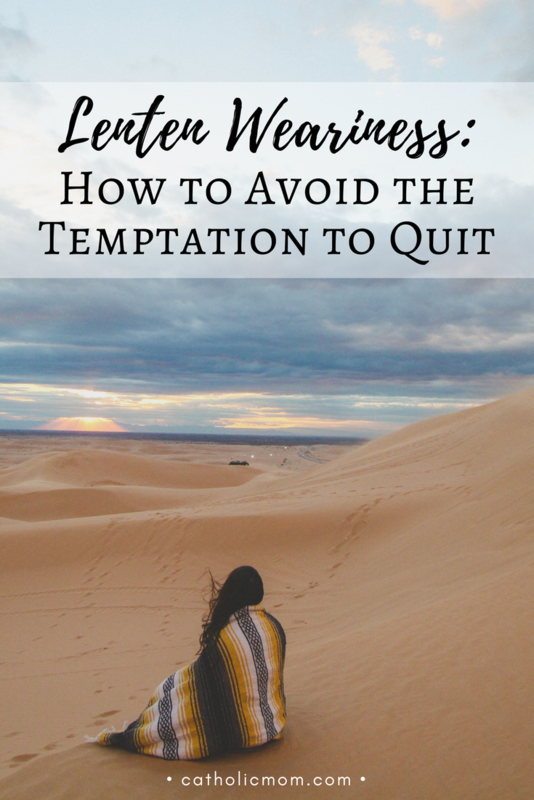 This Lent, I made the decision to give up the swirling negative thoughts and the “shoulds” that talk down to me. For this attempt at resolution, I was going to let Jesus be my guide. To read the rest of my reflection, including some helpful Scripture passages, please click over to CatholicMom.com. Don’t want to quit but had a few stumbles getting started! This is beautiful and true! (And yes… I am with you! My Honey decided we would give up carbs… only to discover what all would be considered carbs so we lasted less than a day as well! And yet… we continue to press in and set aside time to spend with Him and let Him teach us about Lent and grace and the hope of glory, Jesus, who is to come! The temptation to give up can be very strong. I’ve had my own Lent derailed a bit by illness. As much as I had planned to attend daily Mass, I couldn’t go sick and ready to infect others. So, I had to adjust my plans. Actually, it might be a prelude to my upcoming trip as I don’t know how easily I can attend daily Mass with limited transportation. Thank you so much for adding this to the 40 Days of Seeking Him link up this week. I love to see what others are contemplating during the season.